A flange used globally posed a cost and supply problem for Schneider Electric. The challenge presented to MES was to reduce the flange’s production cost while securing its availability. MES was able to meet Schneider’s needs by delivering an end-to-end engineering solution. The Schneider component consisted of a nut and a flange. Both parts were stainless steel, a relatively expensive option that had originally been chosen in order to withstand outdoor applications where potential exposure to moisture, cold or chemical environments could otherwise result in corrosion and component failure. The nut had been brazed to the flange. The use of stainless steel and the added production step of brazing meant increasingly higher production costs for the component, and Schneider was seeking an alternative that would reduce cost without compromising the durability of the finished part. MES proposed an engineering solution that would lower the component’s manufacturing cost while keeping it corrosion resistant. MES would replace the stainless steel nut-flange assembly with a single zinc casting. This change would reduce the component’s production cost by eliminating the brazing step in production. In addition, MES proposed adding a specially formulated surface treatment to the casting to match the level of corrosion-resistance and the performance longevity of stainless steel. The time frame for converting from the stainless steel component to full production of the one-piece zinc casting involved less than twelve months, including designs, prototypes and tests to validate the performance strength and durability of the new design. 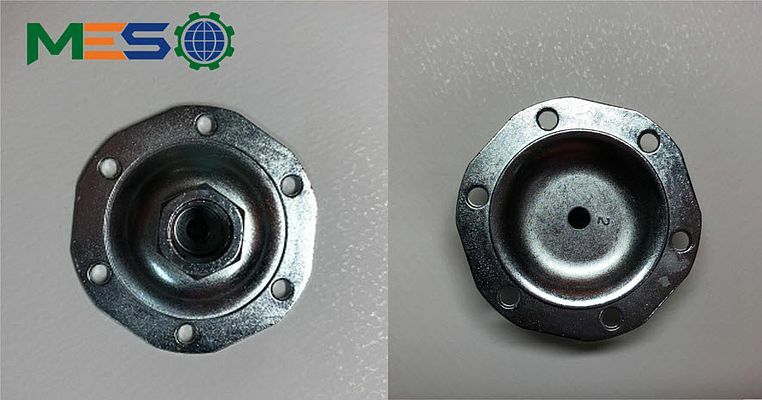 The part was cast in China with manufacturing, quality control and supply chain management supervised by the MES production subsidiary in China, Metrics Ningbo. “By making the transition from an assembled nut-and-flange component to a single zinc casting and producing that part overseas, Schneider Electric has been able to lower substantially the cost of a component used worldwide,” according to MES Sales Manager Michael Dent.